Aircraft proved to be a decisive weapon during the Pacific War. However, no weapon can be better than the men who use it. The Japanese had a clear edge in pilot skill when war broke out, but the Pacific War was characterized by a steady improvement in Allied aircraft pilot skills and a steady degradation in Japanese pilot skill. The Japanese Navy began the war with superbly trained pilots. None of the Japanese pilots involved in the attack on Pearl Harbor had logged less than 600 hours of flying time, and many flight leaders had over 1500 hours’ experience. Flying the excellent Zero, Japanese fighter pilots were able to sweep opposing aircraft out of the skies of the southwest Pacific in the early months of the war. Japanese naval pilot training emphasized quality over quantity. Selection criteria were so strict that no more than 100 pilot candidates were accepted in some years. 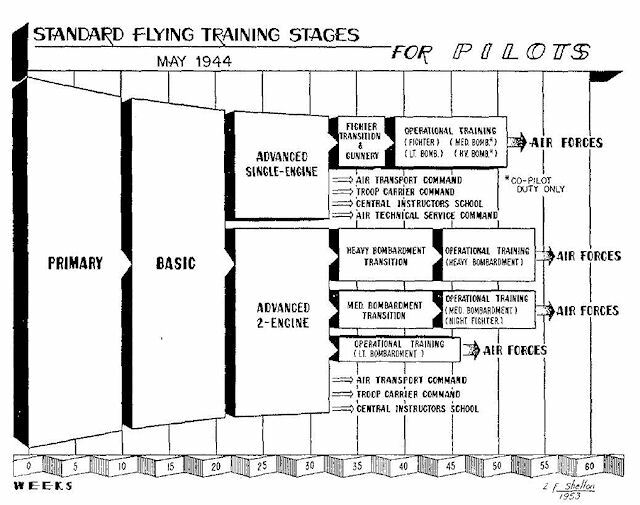 Prior to 1940 the training course was "short and brutal" (Lundstrom 1984), lasting seven to nine months and deliberately washing out large numbers of pilot candidates, particularly among the enlisted candidates. The course was lengthened after 1940, when the need for expansion became obvious, so that there would be time for more of the pilot candidates to reach the required level of proficiency. Primary training was conducted by 11 Combined Air Flotilla and lasted six months. Pilots accumulated between 44 and 60 hours of flight time in the K2Y biplane trainer (later replaced with the K9W "Cypress"), with officer candidates logging more flight hours than enlisted candidates. Primary training was followed by four to six months of intermediate training in the K5Y "Willow". Here the students logged an additional 60 to 100 flight hours. Graduates were then assigned to an aircraft type for operational training with one of the training groups of 11 Combined Air Flotilla. Operational training lasted at least three months, and by the time it ended, officer candidates had logged about 400 hours of flight time and enlisted candidates at least 254 hours. We were hit with a baseball bat for a number of reasons. The Japanese Army adopted the German style of training and, beginning in the Meiji era, our navy began to follow a British style of training. For example, a Japanese Naval aviator would get hit if he failed to land his aircraft properly or drank too much alcohol. Another aspect of this discipline system was that if one person in a group did something wrong, everyone in the group was hit. This is because it was our responsibility to work as a group, and you had to pay attention to what each person did. I thought this form of discipline was very bad, and I am sure the United States Navy would never beat servicemen like the Japanese Navy did. In flight training, the trainee pilot sat in the front seat and the instructor was in the cockpit behind him. If a rookie aviator did something wrong, he would be hit in the back of the head with a wooden stick. One way we dealt with this abuse was by wrapping a towel under our flight helmets. Our instructors caught on quickly and, once we landed, they made us take off our flight helmets, then struck us on our heads with the sticks. Candidates now moved from "Basic Aviation Training" to "Joint Aviation Training" with combat groups. Here the emphasis was on gunnery, combat tactics, formations, and (if appropriate) carrier operations. Fighter pilot training emphasized aerial maneuvers appropriate for dogfights, such as the characteristic hineri-komi or “turning-in” maneuver that many Allied pilots described as a “falling-leaf” maneuver. Fighter pilots were trained to work in the three-plane shōtai, and the pilots in a shōtai developed a sixth sense for each other’s reactions. This helped compensate for the very poor radio equipment in most Japanese aircraft. (The radios were apparently spoiled by unshielded ignition systems.) Pilots were committed to combat only when their commanders deemed them ready, and even those pilots assigned to combat units in China were rarely committed to combat until they had had a year of joint training. Japanese Army pilot training was somewhat less demanding than that of the Navy. The complete training course took two years and pilots graduated with 300 hours' flying time. Basic flight training was conducted in the Ki-17 "Cedar" biplane trainer and continued in the Ki-9 "Spruce" intermediate trainer. Final operational training took place in the Ki-55 "Ida". Pilots were then assigned to a flying training unit for six months, followed by assignment to a fighter squadron, where they received a final three months' training before entering combat. The Japanese Army started the war with inferior aircraft such as the Nate and took heavy casualties over Burma and China even in the early days of the war. However, the Army shared the Navy’s emphasis on dogfighting and had similar personnel policies. About 90% of Japanese pilots were noncommissioned officers. This was in marked contrast with the U.S. Army and Navy, where most pilots were commissioned. The Japanese regarded aircraft pilots as technicians whose duties had little to do with shouldering command responsibility. Japanese noncommissioned officers drawn from fleet service were trained by the Pilot Trainee System (Sōjū Renshūsei, or Sōren), while young men aged 15 to 17 drawn directly from civilian life were trained by the Flight Reserve Enlisted Trainee System (Hikō Yoka Renshūsei, or Yokaren). Competition was so stiff that out of 1500 sailors who applied for the Pilot Trainee System in 1937, just 70 were accepted and 25 graduated. In 1938 the Japanese attitude shifted, and most of those graduates of the Japanese Naval Academy who were physically qualified began to be assigned to flight training. However, only a small number of college students were recruited into the Student Aviation Reserve (Kōkū Yobi Gakusei) to become reserve ensigns, although this program expanded rapidly after war broke out, training over 10,000 pilots in 1943. A dark side of the Japanese system was the great social gulf between officers and enlisted men. Even such superb noncommissioned pilots as Sakai Saburo, Japan’s second leading ace to survive the war, were frequently mistreated by their officers. Corporal punishment was an integral part of training. The late shift towards assigning officers to flight training also meant the Japanese Navy went into the war with a serious shortage of lieutenant commanders and commanders who had both combat experience and flight training. Because Japanese culture discouraged emphasis on the individual, Japanese aces were not given the same attention as Allied aces. However, especially productive pilots would be rewarded with a promotion, which amounted to a nice pay raise for the enlisted pilots. Officer pilots ran the risk of being promoted out of command of flying units. The Japanese press occasionally publicized the accomplishments of outstanding aces for propaganda purposes, describing them as "shoot-down kings" (gekitsui-oh). Although a Japanese officer pilot was typically rotated ashore after a year of peacetime carrier duty, some officer pilots remained on carrier duty for two years after war broke out before being rotated to shore duty.There was no system of regular rotation of enlisted pilots. As a result, Japanese pilots usually flew until they died or were crippled or were disabled by malaria or other tropical diseases. Sakai survived the war because he was half-blinded over Guadalcanal: He mistook a flight of Avengers for a flight of Wildcats and approached incautiously from the rear, making himself an easy target for the Avengers’ rear gunners. Wounded in the head, he somehow made it back to Rabaul, but lost his sight in one eye, was sent back to Japan, and did not again participate in combat missions until the last, desperate days of the war. The Japanese system was suitable for a nation that hoped to win quick, limited wars. When the Japanese attacked in the Pacific, they held nothing back. There was no reserve of skilled pilots to speak of. Indeed, Peattie (2001) has pointed out that, when war broke out, 11 Air Fleet had been drawn on so heavily for cadre for the new Shokakus that its rosters already included significant numbers of incompletely trained pilots. As attrition set in, particularly during the Guadalcanal campaign, the training system proved entirely inadequate to replace losses. Japanese commanders complained about the quality of replacement G3M "Nell" aircrew at Rabaul as early as the Battle of the Coral Sea. Though Japanese carrier pilots continued to show superb combat skill through the end of 1942, by mid-1943 Allied pilots began to notice a sharp decline in their opponent’s flying skills. There were other indications, such as the loss of much of 68 Air Regiment in March 1943 due to poor navigation on the flight from Truk to Rabaul. By 1944, Japan's supply of skilled pilots was so limited that many flight instructors were reassigned from training units to Ozawa's Mobile Force at the Battle of the Philippine Sea, in an all-or-nothing effort to stop the American counteroffensive. The outcome was the slaughter of the Japanese pilots in what the Americans dubbed "The Great Marianas Turkey Shoot." When war broke out, the average Japanese Navy pilot had 700 hours' flying time while Army pilots averaged 500 hours' flying time. This had dropped to 275 hours in the Navy and 130 in the Army by 1 January 1945, reflecting a precipitous decline in the level of training of replacement pilots. By late 1944, a new Japanese Navy pilot graduated with just 40 hours flying time, while his American opponent had at least 525 hours flying time. Relative losses in combat were correspondingly disproportionate: The U.S. Navy lost just two dive bombers and five torpedo planes in aerial combat in the last eight months of the war. The Japanese Army was likewise forced to reduce pilot training to 60 or 70 hours' flight time by 1945, while the U.S. Army held firmly to its requirement of at least 200 hours' flight time to the end of the war. During the 1920s, the U.S. Navy trained its pilots almost as thoroughly as the Japanese Navy. Pilot candidates had to be college graduates who met strict physical standards. All received commissions. Flight training took two years and emphasis was placed on deflection shooting and cooperative tactics. However, in the years just before the war, the Navy shifted its emphasis towards producing larger numbers of good pilots rather than small numbers of superb pilots. The flight time requirement dropped to just 305 hours. As a result, average pilot experience reached its nadir at about the time of the Battle of Midway, when about 62% of U.S. Navy carrier pilots had fewer flight hours than the least qualified Japanese Navy carrier pilots. Of the 138 fighter pilots with which the Navy began the war, all but 17 were officers. Of these, 70% were ensigns or lieutenants junior grade, and most of these were graduates of the Naval Aviation Cadet Program (AVCAD). This program accepted only unmarried men between the ages of 18 and 26 who had completed at least two years of college. These cadets received three months of basic flight training in the N3N biplane trainer, with a fairly high washout rate. However, instructors were judged by their ability to produce large numbers of competent pilots, and less than one in ten cadets failed the subsequent fourteen weeks' intermediate training course. Pilot candidates logged 69 hours during basic training and another 28 hours during intermediate training, plus an additional 18 hours in NJ or SNJ monoplane trainers after assignment to type. Advanced training lasted seven months and the pilots logged another 85 hours of flight time, mostly in obsolete combat aircraft, with emphasis on formation flying, gunnery, and (if appropriate) carrier operations. At this point, the pilots received their flight wings and commissions as ensigns. However, because of the shortage of modern aircraft and carriers for training, most pilots reported to the fleet never having made a carrier landing in a modern combat aircraft. Prior to May 1941, flight training for American naval pilots was followed by operational training with combat squadrons on shore rotation. However, the demand for combat squadrons forced the Navy to create two Advance Carrier Training Groups using pilots and aircraft from the fleet reserve. Minimum flight time was 75 hours, but many pilots logged up to 150 hours while awaiting assignment to a carrier group, though the shortage of flight decks and skilled instructors limited the usefulness of the extra training. As a result, much of the operational training still took place with the combat squadrons. This usually meant another fifty hours of gunnery training and thirty to fifty hours of team tactics with the green pilot's section and division leaders. Once war broke out, the Americans were able to vastly expand their training program, in part because they had a much larger pool of qualified pilot candidates to draw on. It was estimated that 500,000 men in the U.S. had the necessary aptitude to become pilots, although arbitrary eligibility requirements cut this figure to a total of 193,400 pilots trained during the war. These included 35,000 U.S. Army fighter pilots. By contrast, the Japanese graduated just 46,000 pilots. The Americans also had a policy of rotating experienced pilots out of combat units into training units before combat fatigue made them careless. There were experiments with training noncommissioned pilots, but eventually the experiment was abandoned and most of the pilots involved received their commissions. With sizable numbers of reserve pilots and a large training program, and with the new Essex carriers not due to start joining the fleet until late 1943, the American Navy actually increased its training requirements. The pilots who manned the new carriers all had a minimum of two year’s training and 500 hours’ flight time. Replacement Air Groups (RAGs) were established from 1 April 1944 to put the final polish on pilots. Eventually four RAGs were established: two in the Pacific and one each on the East and West Coasts. Flight training was a prerequisite to command of aviation ships and naval stations, and a number of older officers, including Ernest King and Bill Halsey, took flight training in order to qualify for these commands. This produced considerable resentment among younger officers who had chosen aviation early in their careers but found themselves shouldered aside for these commands by the "Johnny-Come-Latelies." Perhaps another factor in the resentment was the feeling that the "Johnny-Come-Latelies" had not paid their dues. Military aviation was extraordinarily dangerous in its early days, with 41 Marines dying in flight accidents from 1920 to 1925 (out of a force numbering around 100 pilots), but while flight training never ceased to be a hazardous undertaking, it was much less dangerous by the 1930s. Halsey failed the eye test for pilot training, but after being assigned to the observer's course (which was sufficient to qualify for carrier command), he somehow wrangled his way into the pilot's course. He thus became the only vice admiral in 1942 who was a qualified aircraft pilot. American aircraft had more serviceable radios than Japanese aircraft, which aided in the use of cooperative tactics. When radio silence was necessary, as when attempting to achieve surprise with an air strike, strike aircraft could exchange communications by having a member of the crew use hand signals employing a variant of Morse code. A dot was signaled by hitting the palm of one hand with a fist, while a dash was signaled by slapping open hands together. Prior to the attack on Pearl Harbor, the U.S. Army gave its fighter pilots solid aviation training, but almost none in gunnery. Pilots arriving at Wheeler Field had 200 to 300 hours flight time, but some had never fired a weapon. Most of the flight leaders on Oahu had close to 1000 hours of flying time and the younger pilots averaged 500 to 600 hours of flying time. However, because the Army required large numbers of pilots for the European theater, it never attempted as thorough of training as the Navy. Quantity had to be emphasized over quality throughout the war, and an Army Air Force pilot won his wings in just 9 months with about 200 hours' flight time. The decision to drop the requirement of two years' college for pilot candidates increased the trainee pool fivefold. Budiansky (2013) has criticized pilot training early in the war, in which civilian flight trainers contracted to give basic training were often given training scripts that pilot candidates found almost useless. The U.S. Army required aircrew candidates to be in top physical condition and with a high intelligence. Candidates were further classified based on physical, psychological, and psychomotor testing. Excellent hand-eye-foot coordination marked a candidate as a future pilot, while manual dexterity and a strong sense of timing marked a candidate as a future bombardier. Ground school took nine weeks. Primary training took ten weeks and began with in the Stearman PT-17, a biplane trainer, and about 40% of candidates washed out before logging the required eight hours of supervised flying time and completing their first solo flight. Intermediate training continued for eleven weeks in the Vultee BT-13/15 monoplane trainer, where candidates logged another 70 hours before being assigned to an aircraft type. Advanced training for future fighter pilots took place in the legendary T-6 Texan, while future bomber pilots mastered the AT-9 Jeep or AT-11 Kansan. During advanced training, candidates logged another 70 hours over an eleven-week course before earning their wings and entering transition. Transition was six weeks for fighter pilots and eleven weeks for bomber pilots. In December 1942 the Army Air Force organized Fighter Replacement Training Units (FRTUs) where new fighter pilots polished their skills during two months of operational training. In some cases, training was much better: P-38 pilots were selected on the basis of highly competitive mock dogfights after 350 hour’s flight time. By 1944 bomber pilots were also given several weeks of operational training before assignment to a combat unit. Both bomber and fighter pilots took about a year to complete their training. Marine Corps aviators were designated as "naval aviators" and were institutionally tied to the Bureau of Aeronautics almost as strongly as to the Marines. They were trained alongside Navy pilots and equipped with the same aircraft funded from the navy budget. Marine aviators were expected to provide air defense for naval bases, freeing up Navy pilots for carrier duty, but the Marines ended up pioneering ground air support in support of the Marine's mission of amphibious assault. This gave the Marine aviators a unique mission, one drawing upon their experience in the "banana wars" in Latin America. It was also compatible with the ethos of the Marines, who were first and foremost infantry. Commonwealth pilots were trained along the same general lines as American pilots, often at locations away from Britain where they would not be subject to air raids. Once the United States entered the war, a number of schools for RAF pilots were set up in remote locations in the western United States, such as Falcon Field near Phoenix. The Chinese had competing aviation schools. The Central Aviation School was originally organized at Hangchow along American lines, and produced a small number of capable pilots before being overrun by the Japanese in October 1937. A competing school at Luoyang (112.442E 34.670N) was set up by Italian advisors, and Chennault claimed that the school "graduated every Chinese cadet who survived the training course as a full-fledged pilot regardless of his ability" (Harmsen 2013). By the time war broke out in the Pacific, the Chinese Air Force was essentially nonexistent, and China relied on American pilots under Chennault for air power. Prior to the Second World War, air combat was centered on the dogfight, in which fighter aircraft attempted to outmaneuver each other and get on their opponent's tail to deliver a fatal burst of fire. Most Japanese fighters of the Second World War were optimized for dogfighting, and they were probably the most maneuverable monoplanes ever built. The Allied pilot who attempted to out turn his Japanese opponent in a dogfight rarely survived. However, American air tacticians, such as Claire Chennault, came to the conclusion that hit and run tactics had superseded dogfighting. Allied pilots looked for opportunities to hit the enemy by surprise and from above, and if they failed to destroy their target, they simply kept going. If they were themselves surprised, they would head for the deck and perform a sharp turn to try to shake their pursuers. Maneuverability became the least important performance category for most American fighter aircraft designers, who chose to optimize speed, protection, and firepower instead. In addition, Jimmy Thatch pioneered cooperative tactics such as the scissors or Thatch Weave. A pair of Allied fighters would fly a few hundred yards apart and keep an eye on each other's tails. If one of the fighters was jumped by an enemy fighter, his wingman would immediately turn sharply towards him, which warned him that he was under attack. He would then turn sharply towards his wingman, forcing his pursuer to either break off or be vulnerable to attack by his wingman. These tactics were so effective that a saying began to go around: A lone Wildcat against a lone Zero was outnumbered ten to one, but two Wildcats against ten Zeros outnumbered their opponents ten to one. The effects of the uneven battle of attrition became evident as early as mid-1943. On 25 April 1943, a group of just four Corsairs defending Henderson Field engaged a group of 16 "Bettys" and 20 "Zeros" and shot down five aircraft at the cost of two of their own. On 5 June 1943 a sweep by 81 "Zeros" opposed by 110 Allied fighters over the Russell Islands cost the Japanese 25 aircraft versus seven for the Allies. A sweep on 12 June had a similar outcome. Such lopsided outcomes would have been unthinkable a year earlier. The Allies gave much more publicity to aces (pilots who destroyed five or more enemy aircraft) than the Japanese did. 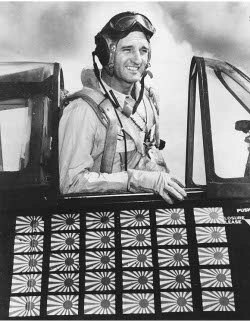 An ace was almost certain to be decorated for his accomplishment, and particularly outstanding performance could win an American pilot the Medal of Honor. On the other hand, the brass saw no need to promote an ace unless he also displayed superb leadership qualities. Many aces, such as Jimmy Thatch and Joe Foss, had such qualities and would achieve high rank. Others did not. As these tables show, the top Japanese aces claimed many more kills than their American counterparts. There are a couple of explanations for this. Many of the Japanese aces were credited with a large number of kills over China against inferior pilots and aircraft. Japanese pilots were not rotated home after a certain number of missions; they flew until they were crippled or killed, and this meant they had the opportunity to run up a large number of kills. American claims required confirmation from gun cameras or a second pilot, and postwar analyses of Japanese loss records tend to support their claims. Japanese claims were not nearly so well verified and may be badly exaggerated. A disproportionate share of aerial victories were achieved by a small minority of fighter pilots. Of the 10,049 Marine pilots of all types trained during the Pacific War, just 120 became fighter aces, while the Japanese Army claimed just 125 aces out of all pilots who saw combat from Nomonhan on. A rough rule of thumb was that just 5% of fighter pilots who saw combat would become aces, but aces accounted for about 40% of all kills. On the other hand, over half of all fighter pilots who saw combat never scored a kill. Predicting which pilots would be successful in aerial combat proved as difficult as predicting which officers would be effective combat leaders. However, as a rule, aces were extremely aggressive, had excellent vision, had superb situational awareness, and were able to make snap decisions. And once the enemy has got you and is clobbering you, that's slow too. It's like lighted matches being slowly dragged across the bunched-up flesh of your brain pan. It feels like your brain is slowly dissolving under the pain on top of it. It's a fight to keep your brain together, and while you're fighting this fight, putting, it seems, your two hands on your mind and holding it with all the strength of your fingers, how long it seems to last and how far away the end you want seems to be. I've had help in fighting this kind of fight from two Huns with whom I struck up a brief acquaintance on separate occasions. Each fought very well. They were crafty and had courage. One of them I thought was going to be real serious trouble for me. The other I thought was going to be able to get away to fight another day. But suddenly, i don't know, something happened in their minds. You could see it plainly. Their brains dissolved under the pressure of fear and had become just dishwater in their heads. They froze to their sticks and straightened out and ran right into their graves like men stricken blind who run, screaming, off a cliff. Productive fighter pilots thus were those had high aptitude, received tough, realistic training in effective tactics, and possessed high morale characterized by the kind of discipline sometimes described as professionalism. Aces were also characterized by a deep understanding of their aircraft and its weapons systems and a burning desire to best their enemies in aerial combat. Boyne (2001) summarized these qualities as a combination of a "warrior gene", hard work, and dedication to the mission. Pilots who felt any reluctance to engage, who may have numbered as much as 65% even of well-trained pilots,did not score kills. Fighter aces were usually men with an unusual gift for introspection, who could go over every minute of a mission in their minds afterwards and analyze their own mistakes. While a few aces were men willing to take reckless chances, most approached their profession in the manner of World War I ace Eddy Rickenbacker, who described it as "scientific murder." Experience greatly increased the odds of survival. After his first five missions, the chances of survival of a fighter pilot increased by as much as a factor of twenty. Some of this was culling of the less promising pilots, but much of it was the new pilots learning, the hard way, to remain alert and situationally aware, particularly by constantly scanning the sky for enemy aircraft. The ability to spot enemy aircraft was vital, since the outcome of most engagements was determined by who spotted the enemy first, and it was a skill requiring both excellent eyesight and considerable practice. Notwithstanding the false modesty of fighter aces who claimed not to be great shots, marksmanship was vital, perhaps even more so than piloting skills.